All courses are 4 weeks long. To register, click on the Register button next to each course or go to our online Registration page. Join the Minecraft Madness! Minecraft is a widely popular 3D video game that lets users explore, construct, create, and interact inside an open and changeable virtual world. Because of its educational potential, Minecraft has evolved into an excellent (and engaging) way for students to learn about computer science, technology, and other STEM-related subjects. 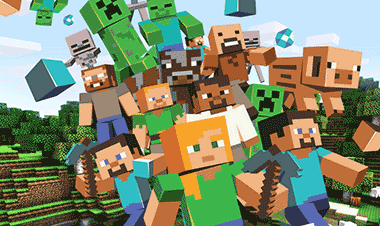 If students are already Minecrafters, our courses will help to satisfy their love of the game. If they are not familiar with Minecraft, these courses are a wonderful way to get started on developing a digital literacy that will aid them throughout their academic careers. Both experienced and new Minecrafters are welcome, as each of our monthly courses introduces a new world or civilization, with different missions, quests, or challenges. These tasks encourage students to learn, to think strategically, and to work together to accomplish their goals. Students do not need a Minecraft account as we use a proprietary curriculum where kids access Minecraft using our accounts and explore and learn in our networked server. 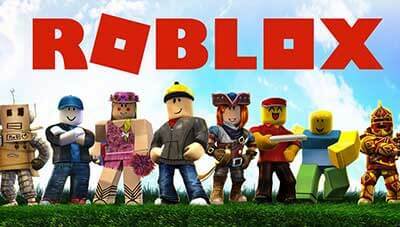 Children who love to play Roblox and want to learn how to create their very own Roblox game can now do so! They will learn the basics of Roblox Studio, the software used to develop Roblox games. There will be some basic coding work but the jest of the course is focussed on learning and working with the different 3D elements of the Studio program. This is an introductory course for beginners. Children who have already taken this course should wait for our Roblox Studio 2 course which we are currently developing and will have available in the Spring cycle. Learn to build some amazing robots! (Can you tell our puppy robot from a real dog?) 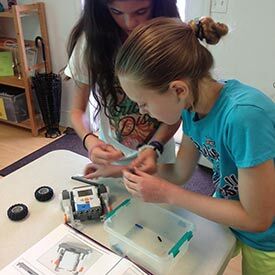 Students are introduced to the basics of robotics while working hands-on with various LEGO robotic systems, including Mindstorms, Mindstorms NXT, and EV3. Students design and construct different robots and then use computers to teach them to move, react, and solve various challenges. This month, children will build and program robots to participate in a team-based sumo bot challenge. Each month there are separate Beginner, Intermediate, and Advanced sections for new and returning students.